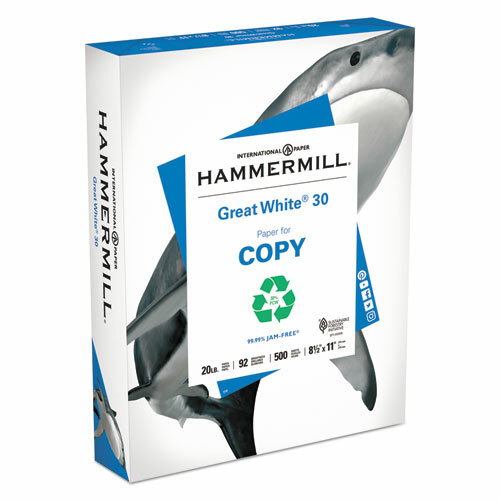 Great White 30 Recycled Print Paper, 92 Bright, 20lb, 8 1/2 x 11, White, 5000/CT - Delivering office supplies to Chicago and the Chicagoland area for over 50 years! Versatile, 30% recycled printer paper makes hard work seem effortless. 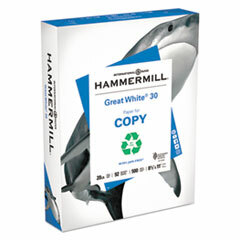 Great White 30 is a dependable, everyday sheet that runs efficiently through all office equipment. making it ideal for copies, forms, faxes, memos, reports, price sheets, bulletins, legal briefs and more. Precise, accurate sheeting, consistent moisture content and curl control ensure smooth, trouble-free performance. Extremely smooth, it virtually eliminates paper jams and is backed by the 99.99% Jam-Free Guarantee. Acid-free material prevents yellowing over time to ensure a long-lasting appearance. This product was made from wood sourced from a certified managed forest.